During a root canal treatment at Newnham Family Dental, you should not receive more discomfort than receiving a normal dental filling. When a tooth is badly damaged due to decay, trauma, disease, crack and gum disease, the nerve of the teeth can become swollen and inflamed, leading to significant pain. Root canal therapy is used to treat the infected nerve by simply removing the nerve and retaining the natural structure of the tooth. Sometimes your tooth may be then strengthened and protected with a ceramic crown. Why go for root canal treatment? Allows you to maintain your natural tooth. By keeping your own tooth, prevents nearby teeth from moving out of their normal position and tilt into the space left by a missing tooth. Your dentist will examine and take a x-ray film of the tooth. Local anaesthetics are used to relieve pain. A protective latex layer called rubber dam is placed over the mouth to keep the tooth clean and dry during treatment. The nerve is then removed from the tooth with a special instrument called files. The inside of the tooth is then cleaned and washed thoroughly. Special anti-inflammatory and antibacterial medication is placed inside the tooth to relieve pain and stop the infection. The tooth is then sealed with a temporary filling to prevent any bacteria from entering the tooth and causing an infection again. If required, antibiotics may be prescribed to treat severe abscesses and infection. It is especially important to be extremely careful with the root canal treated tooth at this stage. Make sure the tooth is kept clean and do not chew anything too hard as the tooth is still quite brittle at this stage. Pain and discomfort, if any, may only last a few days. This is the final stage of the root canal treatment. Sometimes it may take a few month for the infection to clear up, therefore, before commencing this stage, care will be taken to ensure that stage 1 was successful and safe to proceed. In the 2nd stage, rubber dam is placed once again to isolate the tooth. A special filling material called gutta percha is placed inside the tooth as a seal to prevent bacteria from entering the tooth. A gold or ceramic crown is usually recommended afterwards to strengthen the root canal tooth, as it is more prone to fracture. A crown will also provide a better cosmetic appearance. Although root canal treatment is successful in most cases, possible complications may still occur: Here is a few possible complications, the list is not complete. Loss of tooth – it is impossible to predict exactly how long the tooth will last after treatment. Success will depend on various factors eg. health, age, oral hygiene and amount of remaining tooth structure. Crowning is often recommended after treatment to help strengthen the tooth. Infection – after treatment, the infection inside the tooth should resolve, however, it is still possible that the tooth may be re-infected again. If this happens, the tooth may have to be treated again or removed. Discolouration – the treated tooth tend to lose its original whiteness and become darker over time. This can be treated by bleaching or crowning/veneering of the tooth. Pain/Discomfort – do not be alarmed as pain may persist for a few days following treatment. Some pain relieve could be taken. However, if pain is too severe or last for more than a few days, contact your dentist. Fracture – a root canal treated tooth are weaker than normal teeth and this is why a crown is often recommended. File breakage – extremely fine and delicate metal instrument are used to clean the inside of the roots which can occasionally break during use. You may be referred to endodontist to have it removed. Sometimes leaving the portion in the tooth has no long-term effect. Your dentist will discuss with you in detail if a file breakage occurs. Altered Feeling – a root canal tooth will feel different from other teeth as the tooth should feel no more sensitivity. Re-treatment – pain and infection may occur months or years after root canal treatment. A number of reasons could contribute to this – decay, trauma or crack, which allowed bacteria to enter the tooth. Root canal treatment may be repeated or the alternative is the extraction of the tooth. 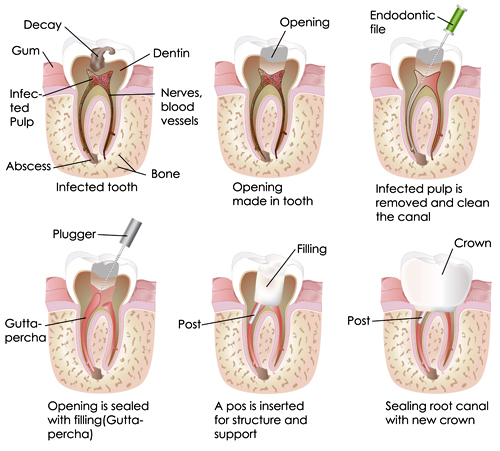 Non-healing infection – sometimes an infection may not heal after root canal treatment. This could be due to resistant bacteria, a cyst or a reaction to materials. The root canal will need to be retreated while in other cases an apicoectomy may be needed. If you require this, your dentist can provide you with more information. If you experience any of these symptoms, please contact us.